I'm a list maker and am looking forward to keeping my quilty and daily lists all together is one place in 2016. I saw this Quilter's Planner a while ago and immediately ordered mine for the new year! 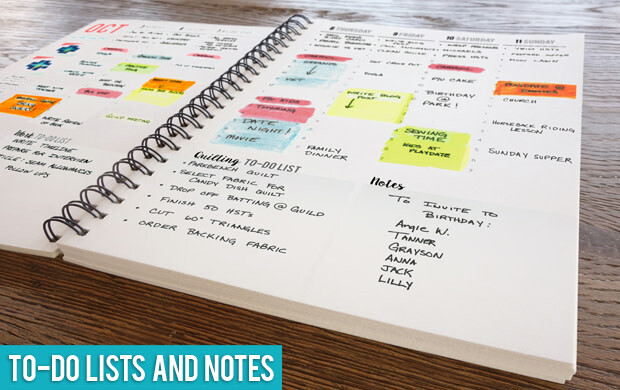 What fun it will be to have my calendar and project planner all in one! 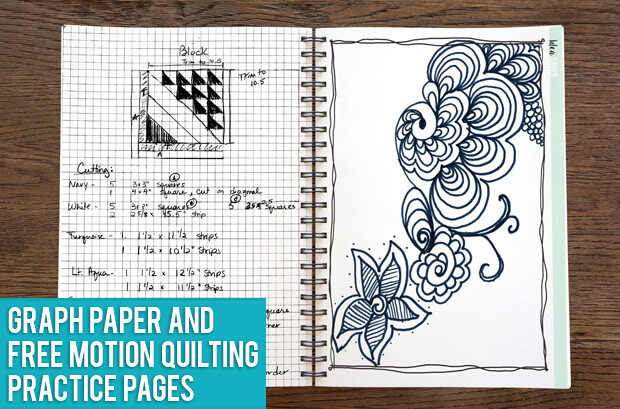 You have 3 more days to buy The Quilter's Planner at $35 from the Indiegogo pre-order site! If you have friends who you know haven't bought theirs yet, will you please pass on the word for me? OnTuesday, December 2nd, the planner will still be available on Indiegogo, but price will rise to the recommended retail price of $39.98. ...to a making a cozy Christmas Quilt. I participated in this Kate Spain Christmas Swap last June to collect charms for this exact kind of simple, relaxing sewing. Along with tackling my big pile of Fall binding, it's rejuvinating to have something to sneak away to while others are napping, watching football or playing on their computers during this holiday week. How about you? Is stitching part of your holiday R&R at all?? Tuesday Archives #90: Yo-Yo Fun! Noooo....not this kind of Yo-Yo...though this is about how good I was at the darn thing! Before I even started blogging, Sew Take A Hike was one of the blogs I followed regularly. I started to "yo-yo" along with Penny, but never even made it to 100. Penny's goal is 1008 for a coverlet, and upon my latest visit to her blog, her progress bar says she is at 892. You can find her tutorial for making Yo-Yo's right here. You can find her tutorial for sewing the Yo-Yo's together (by machine) right here. Nothing better than watching the first snow of the year through the eyes (and hearts) of children. 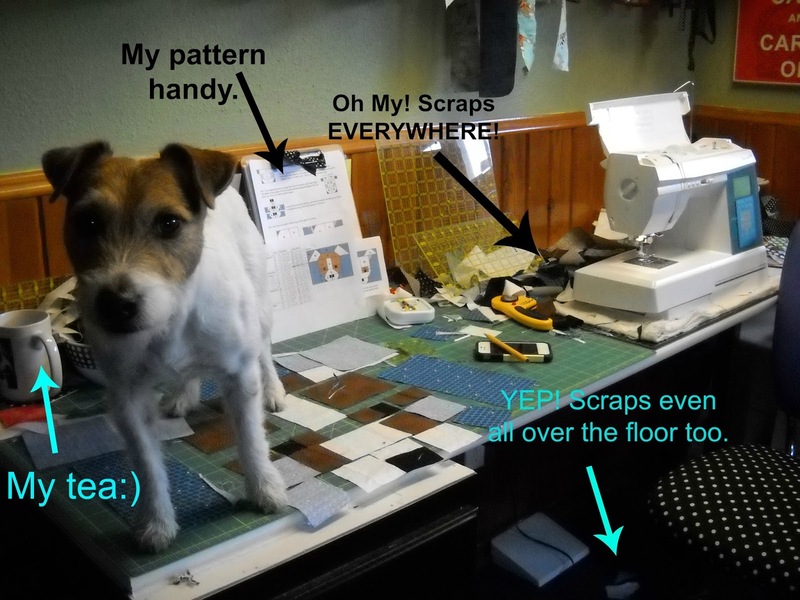 Tuesday Archives #89: YOUR sewing spot! I'm so lucky this picture didn't come out blurry as I was laughing when Jackson jumped on the chair, onto the counter and literally photo bombed my space! He should be on TV huh!? I returned from switching the laundry and just laughed at myself thinking, wouldn't my blogging buddies be surprised to know...Yep! I'm THAT person who takes up two spaces at a quilt retreat! Oh my! I'm THAT person who has to vacume my floor space before I leave a quilt class. And seriously you guys, the messier, the more creative my outcome. I get caught up in the creative process rather than the preciseness. It's just how I work. So how how about you? This week's linky offers the opportunity to not only share your archives by extends the challenge to "snap" a photo of your sewing spot as it IS right now, this very moment and create a post to share with us what it says about you. When I heard about the Trunk Full of Quilts online trunk show event hosted by Soma of Whims and Fancies and after touring the show myself this mornig from the comfort of my home, warm in my winter bathrobe, sipping my moring tea, I was inspired to take a look through my own archives and share all the WORD quilts in my collection of quilt. My "trunk" was a little more full than I remember! Here is one of my very first quilts: Oh Happy Day. These letters were traced from a lettering template and appliqued on. ...and even on the back of quilts to personalize them. Most of all, after making wonky hearts on and off for a year, I pulled them altogether in this Aniversary Quilt I finished for my husband and I in 2014 by adding our "favorite" words to the quilt.. Click over to here to read more about this fun finish and check out my tutorial for making those fun hearts! 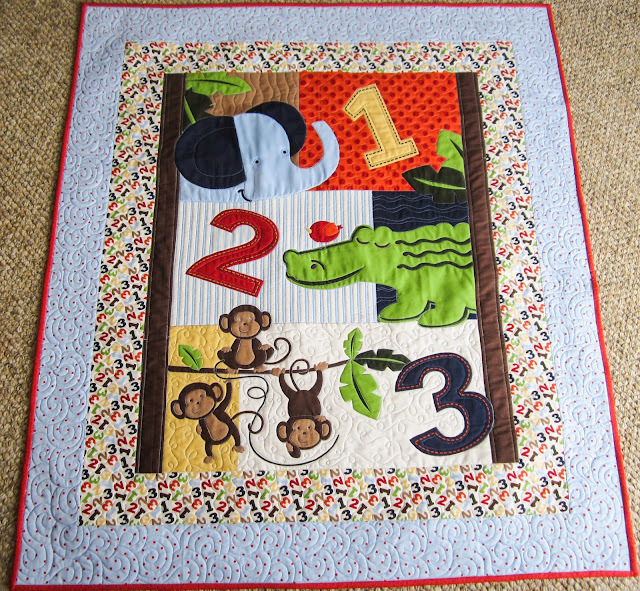 And my latest finish which most of you have seen, our grandson's birthday quilt. Once again, I used letting templates and appliqued these words on. Thank you again Soma for this fun trunk show and for my being awarded such an awesome prize! ...the rejuvinating, sunny, warm Arizona sunshine I grew up in. Lake Mead, flying into Las Vegas, Nevada. My mom's spagetti is ALWAYS my FAVORITE!!!!! Thanks mom. ...and the love and joy of simply being with family. I found myself awed by the love of each and every stitch and was reminded to not let myself get caught up in perfection of the outcome, but to enjoy the process of my quilting more. I was also reminded as I watched our friend read the label of this quilt below...the importance of labeling our quilts. This small little, hand scribbed label, led her into a reminiscent account of her mother and grandmother. It was obvious she cherished her mother's handquilting and it was heartwarming to listen to her stories. It made me curious of what stories my quilts will leave behind?? I'm so glad to be a quilter! This next year I am going to make it a goal to hand quilt at least one quilt. How about you? Do you still hand quilt? Sometimes? Never? Always? 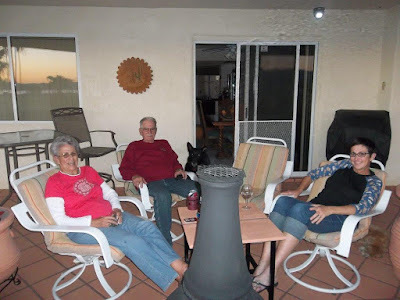 Linking up with everyone else at Kathy's Slow Stitching Sunday linky. I always get this way after I finish a patterned quilt and I spent a good portion of my "sewing Sunday" just looking at books and admiring my fabric stash! Anyhoo....I'm grateful for the great week coming up! I only work two days this week (WAHOOOO!!! )....as hubby and I are flying out to visit my parents in Arizona! It's sooooo very odd for us to take a Fall Vacation....but we are way excited!!! Andddd...I literally dusted off my cabin applique and have it packed for the journey! THIS is going to be a winter project FOR SURE!!! You WILL see some progress on this quilt here on the ol' blog this Winter! (Note: my exclamitory commitment there! Yah me!) And my mom and I already have a "date" to visit her local quilt store! I can't wait! It's always fun to see new quilt stores from other parts of the country. Tuesday Archives theme this week is: WILD things! 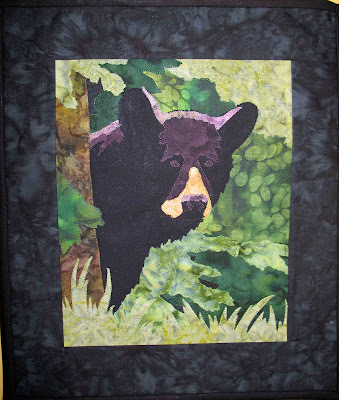 I'm thinking wild animals, wild...out of the box creative quilting?? I think you guys know me well enough by the letter W, to know I'm pretty liberal with the definitions of my themes. Truly, thanks for having fun with me as we all dig through our archives to rejuvinate old posts every Tuesday. It's ALWAYS fun and inspiring!! Just know, I'm grateful to all of you who are a part of my virtual quilting community. 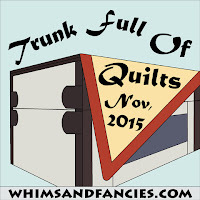 Tuesday Archives # 87: Quilting Gone WRONG!